Mike and I hosted our good friends the Bradley’s last Saturday night for dinner and a movie (except the movie was at the theater and by the way it was so bad it would have been way better for us to get a rental). We saw Eat, Pray, Love and if all you want is a huge close-up of Julia Roberts’ big teeth, than this is the movie for you. I slept through Italy, Keith slept through India and Mike through Bali. Debbie was the only alert one and I am not sure why since she didn’t like it either. Anyway, back at our house I served appetizers (the movie is very long so we were all starving) and then a simple dinner of the Barefoot Contessa’s Shrimp Scampi, garlic bread and a really pretty fresh summer salad. Dressing: Mix together 1/3 c. red wine vinegar, 2 tsp. sugar, ½ c. salad oil, ¼ tsp. basil and oregano and 2 tsp. fresh chopped parsley. Shake it all together until sugar dissolves. 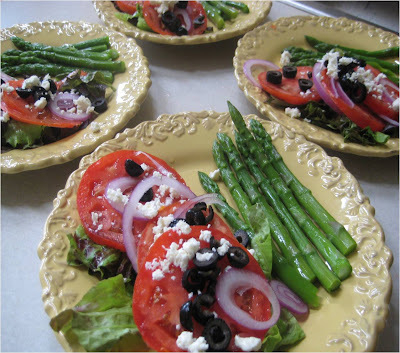 On a nice large salad plate, lay tomatoes and onions in a pretty curve. Top with feta cheese. On the other side of the plate, lay the asparagus. Drizzle with dressing. I assembled everything before we left and drizzled on the dressing when I was ready to serve. Try this – it is pretty and delicious!